Are you a wheel person? Me, not so much. 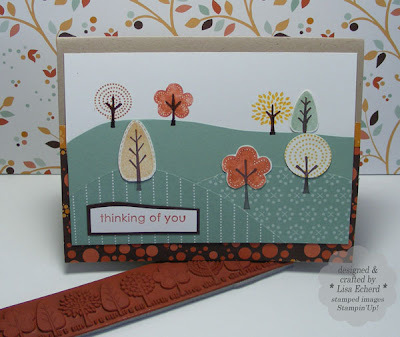 Actually, I love many of the designs for the Stampin' Up! Wheels; I just find I don't use wheels much when I buy them. Part of the problem is the rolling action is hard on my hand and arm. It is the same motion as a rotary cutter and that bothers me, too. But whatever the reason, some people love wheels and others don't. 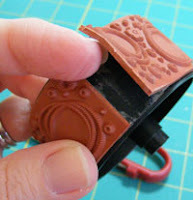 If you don't care for using a wheel or you just want more versatility and easier storage, you can take the rubber stamp part off the wheel and turn it into a regular stamp - a cling stamp you use on an acrylic block, just like the new SU! Unmounted stamps. 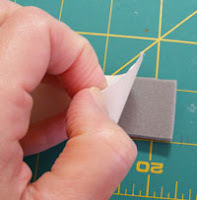 You will need some EZ Mount foam. It comes in 8 1/2" x 11" sheets. I purchased mine via E-bay. The vendor I used does not have any listed for sale right now. Do a search on "EZ Mount Stamping" and you should find several vendors selling by the piece or in packs of 5 pieces or so. You want the regular EZ Mount foam not the thin. Find the seam in the red rubber on the wheel. Cut the rubber apart at that seam. Gently peel the rubber off the wheel. I've done three of these so far and the rubber has come off very easily. Peel back the printed layer of the EZ Mount foam revealing a very sticky side. Tip: Use a clothespin to hold the paper back on your EZ Mount sheet so you have access to the sticky part. Place the rubber part of your wheel image onto the sticky part. 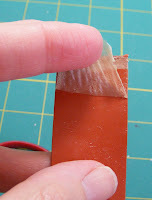 Trim around the red rubber with an old, but sharp pair of scissors. 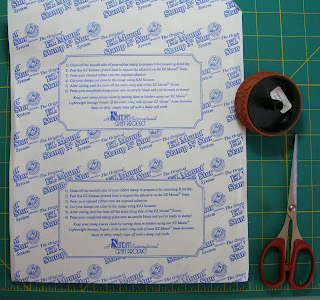 Take care not to "cut in" - that is letting the scissors cut away the foam underneath the rubber. Cut as even as you can. 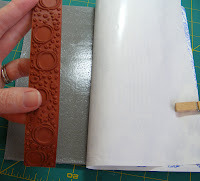 Turn the stamp over and peel off the white layer on the other side to reveal a 'cling' side that will cling to acrylic blocks. The instructions for EZ Mount caution against storing these on acetate sheets. The acetate apparently doesn't agree with the cling part. Now you can use your wheel just like a stamp! 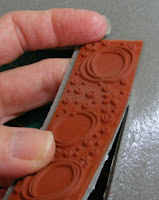 Using a gridded block, I've found it very easy to stamp one row after another and create background images. Also, you can use markers to color in just part of an image like any other stamp. This is how the little trees were done in the card above - using the Funky Forest Wheel (I, mean, stamp.) I did have to color the trunks with markers after stamping since this image is so small. I'm so pleased with this process, there are now several wheels on my SU! wish list including the Love one in the mini catalog that goes through next month. I wanted it for the greetings and it will be easier to color in greetings with markers and stamp them once it is unmounted from the wheel. Thank you for the instructions on doing this. I have several nice SU rollers that just sit there because I can't roll a straight line either even with the gadget for making straight lines SU sells. I'm going to try this out on a few and see if that helps me use them. I have so many wheels that I never use. This is such a great idea. Gonna give it a try. Oh and I love the darling card that you made with your new 'stamp'! Wow- what a great idea! At first the thought of unmounting my wheels intimidated me a bit, but your great instructions are making me think I just might have to give this a try. It really doesn't seem so hard to do at all! 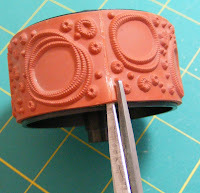 I have so many wheels I love but don't often use them because of the same reasons you mentioned; also because several of them are really hard to stamp straight. Thanks for your wonderful tutorial!